Update: These encoding methods look promising but I've still not got a 100% solution. 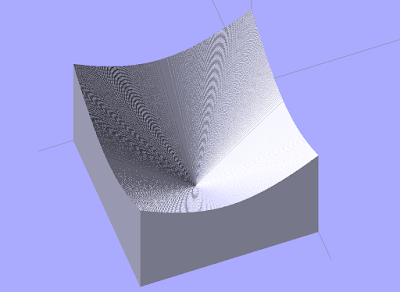 I've had some success using the GPU to do general purpose calculations in Processing. Processing now supports Shaders, although the documentation is sparse. This tutorial is worth looking at, and I found the Book of Shaders very useful too, although it requires some support to be finished. Before we go anywhere, there are already some drawbacks. This example seems to break with (very) large numbers, perhaps because Processing stores RGBA colours within 32bits. This method also drops the fractional component. Therefore, to retain fractional precision (such as working with numbers in the range 0:1), you need to multiply your numbers up (by 10, or 100, etc) to move the decimal point and consistently divide them own again after the GPU operation. Also, it doesn't support negative numbers. Just a few drawbacks! The meat of the problem is how to get data back from a GPU. The GPU is designed to write images to a screen buffer. It is intended as a fast one-way process, where the GPU crunches some numbers and writes out to the screen. If we can subvert that process we can make use of the parallel and hardware optimised maths processors in the GPU. The code I provide below is just my initial foray, it is by no means comprehensive. I'm still trying to figure it out myself. Debugging GLSL code is hard because the GPU as a peripheral does not pass any errors back. It does seem to fail gracefully (i.e., at worst, not render any thing to the screen), but it leaves you wondering what recent change in your code made it go to a black screen. To debug you basically have to inspect variable values with 'if' statements, and change the colour of the screen to represent true or false values. Detective work! I'm doing a lot of image processing in research at the moment. To develop this code I've worked from the MaskImage shaders example from within Processing - it would be worth checking that out. It uses a 2D texture shader written as just a Frag Shader - so hopefully simple enough to understand. The key requirements for me was to be able to send specific values to the Shaders, and for the Shaders to then send the answers from calculations back. I think it is best to imagine the Shaders as an idiot swarm of processors. They all have to run the exact same code, and you have no control over which perform when. The Shaders will complete a whole image-worth of calculations, but they can't intercommunicate or send information back whilst the operation happens. That is the big constraint to GPU programming as I understand it. It is an uncontrolled one-way process. There are probably lots of tricks possible with branching code to get Shaders to do different things, but you'd still have no control over timing. We predetermine the calculation operation of the shaders. We set up the information available to the shaders (prior, because it is a one way process). We then action the shaders do their individual calculations on the image buffer. The Shaders store their results by modifying pixels within a returned image buffer. Therefore, within Processing we capture the resultant image from the Shaders, and then inspect each pixel for that Shaders answer. I hope this makes some sense. 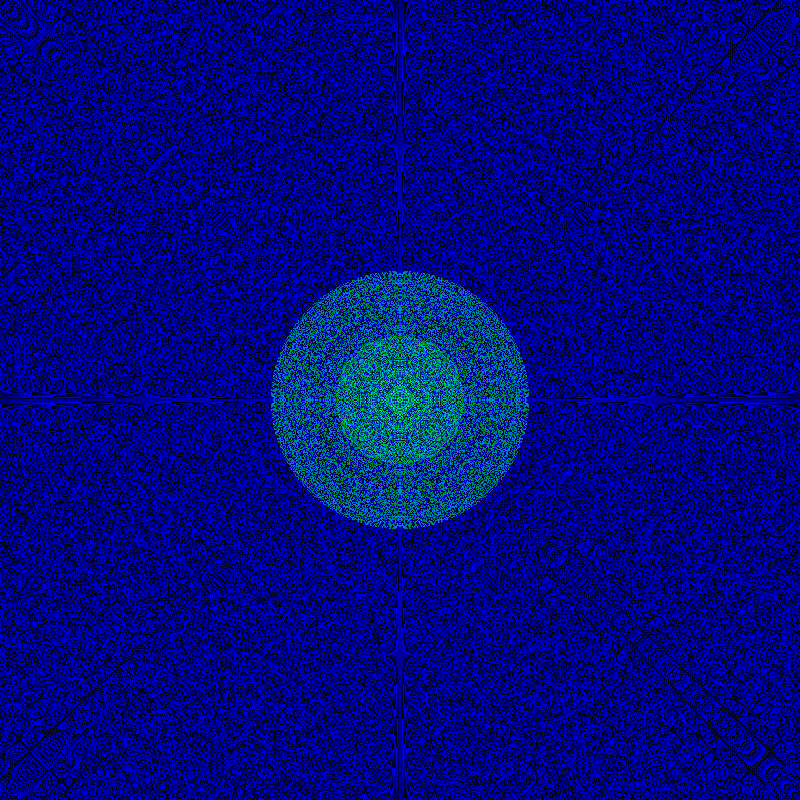 I am working with the assumption that there are as many Shaders in operation as there are pixels in the returned image buffer. If you are doing some form of image processing you may not really need to encode data into a source image to begin with. You just pass the GPU your source image and you are only interested in decoding results back out of the returned image buffer. However sending data both ways is a good test, since the GPU doesn't normally send useful numerical data back. If we can get information to flow both ways it can become a debug method in more complex use. As a side note of the above diagram, if you encode data into an image buffer, it is unlikely you'll get anything that resembles a sensible visual image. A screen shot of the screen buffer in error. I found a GLSL example of encoding a float into a vec3 datatype, here. So I rewrote this to encode a float into color() to work in Processing to give that two-way functionality. I found that the example used the value of 256 for it's encoding operations, but this caused error artefacts in my results. The value of 255 works consistently for me. This requires a bit of investigation, and may have something to do with the very large number problem. We then need the corresponding functions within the GLSL Shader code. In general, the code for a Shader looks complete, it has a main() and it can have it's own support functions. 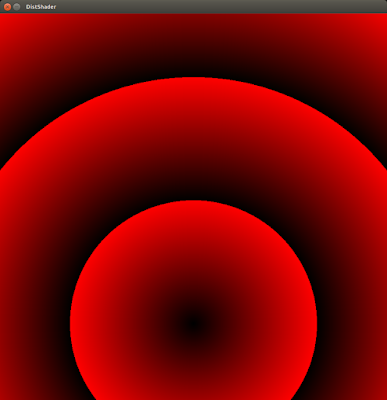 It runs independently from Processing, executing on the each of the GPU Shaders. You have to store the GLSL shader code within the data folder of your processing sketch, or else reference it's file path directly when you initialise the shader in Processing. This will make more sense when we look at the whole code. It is important to note that the GLSL side decode has an extra * 255 operation, because RGBA are stored in GLSL with a value between 0 and 1. We bring that 0:1 value to a 0:255 value to be consistent with the processing encode and decode operations. Processing has more user-friendly information available, so I decided to be consistent with Processing, rather than make Processing consistent with GLSL. // Create an image to store our data. // data from the GPU rather than render to screen. // answers from the shaders. // the /data/ folder of your sketch. // Set a value to pixels of left half of image. // Set value to pixels of right half of image. // Pass shader the image buffer. // Ready our PGraphics buffer. // Draw buffer to screen, just to see. // for me, transfer whole buffer to a PImage works. // Nothing more to do. // so no need for /255 unlike GLSL encode. // buffer needs values in 0:1 range. // Divide through by 255. // Reencode the value back to a RGB value. // Write it back to screen. This is not perfect. Here are a few interesting methods to break the encode and decode algorithm. Instead of using encodeFloatToColor(), you can place a colour into the data_set image buffer directly. If you use color( 255,0,0,255), color(0,255,0,255), or color( 0,0,255,255), the encode routine does not encode properly. I haven't figured out a solution yet. That means there are 3 distinct float values which won't encode and decode properly - and perhaps more. // screen and/or image buffer. 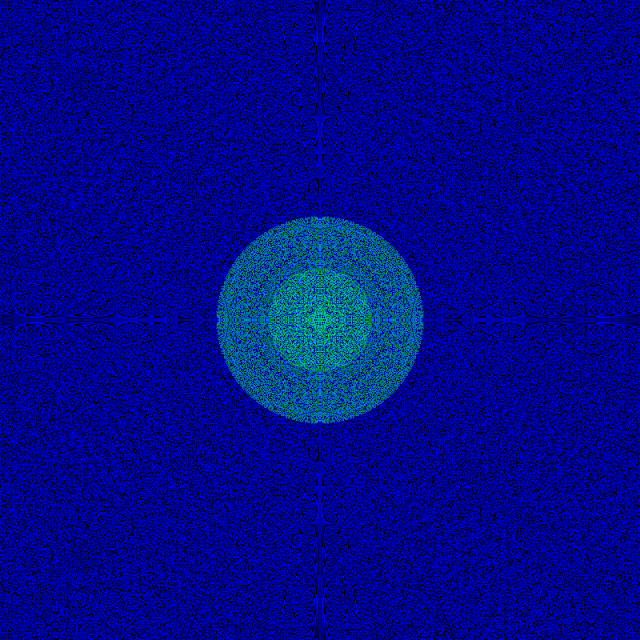 // GLSL buffer Y axis is inverted relative to Processing! // render so they action their calculations. Another way to inspect our results: we get Processing to write out an ascii file that we can read into OpenSCAD. It is laborious to inspect every pixel of an image, so instead we can do it visually by using OpenSCAD to draw each decoded pixel value as a height map. // Write out data to an ascii file. // Use nf to remove decimal place. // OpenSCAD wants blank space between values. // Make sure data is written properly. The surface render looks a bit like a cater, which means that although we have concentric red rings in our image buffer, the values decode as an increase in distance from the cursor position at the centre.